Stems: Usually branched, usually hirsute, sometimes glabrous. Leaves: Basal and cauline; alternate; petiole present on basal and lower cauline leaves, absent on upper cauline leaves; blade ovate to narrowly lanceolate, 2 to 12 inches long, .4 to 4.8 inches wide, base rounded to cordate, margins usually coarsely serrate to dentate, rarely entire, surfaces usually hirsute, sometimes glabrous. Inflorescences: Heads, radiate, solitary; involucres hemispheric, .5 to 1.6 inch across; phyllaries lanceolate to linear, .3 to .7 inch. Peduncles .3 to 1 inch. Flowers: Chaffy bracts subtend the ray and disk florets, sharp-tipped, tips often orangish; ray florets 8-21, reddish purple, rarely pink; corolla ligule 1.2 to 3.2 inches long, .25 to .75 inch wide, spreading to drooping; disk florets numerous, much shorter than tips of chaffy bracts; corolla purple or yellow, tubular, lobes 5. Fruits: Achenes tan, wedge-shaped, .16 to .17 inch, usually glabrous; pappus a crown of 1-4 short teeth. Uses: Native Americans chewed the root for coughs and took an infusion of roots for venereal disease. 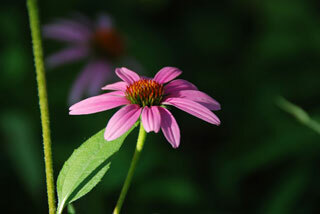 Comments: Echinacea is from the Greek word for hedgehog, alluding to the spiny chaff.